But I’m getting ahead of myself. We’re exactly halfway through The Wild Storm. At least, we are if Warren Ellis and Jon Davis-Hunt stick to the 24 issues they originally promised for the series. 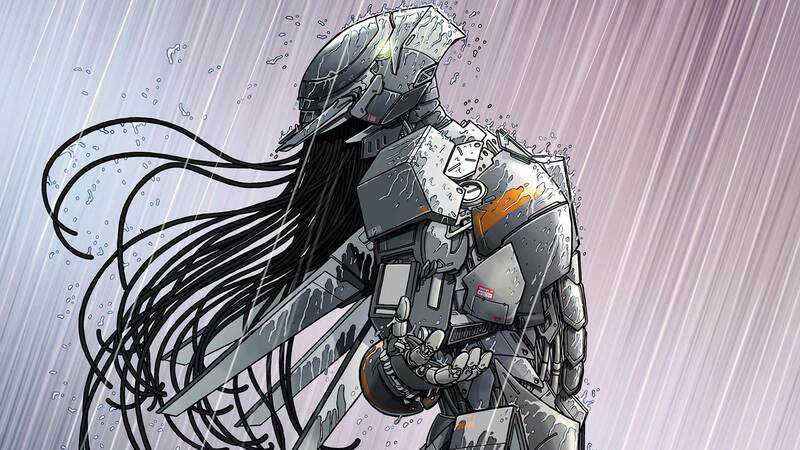 If we are, then THE WILD STORM #12 is quite an issue to end the first half on. So, were both the operations successful? I’m not sure we can tell yet, or if it’s even so cut and dry. The wild CAT seems to have gotten into the facility, accomplished all of their objectives and gotten out without anyone seeing them—anyone still living, at any rate. They successfully destroyed all the data IO had received from the Hightower facility, and destroyed the freaky brain-farm that seemed to be at the heart of their machine telepathy development. They did have to eliminate some security guards…but we got an awesome action sequence out of it, so I can hardly fault them for that. But IO… They seem to think their operation was a success, and they did get the information they were attempting to steal, but unknown to them, the entire thing was compromised. Skywatch and Henry Bendix know that they were behind the bot storm that was supposed to serve as IO’s cover. And most fascinating of all, they were compromised by what can only be called simple human carelessness. Mitch Saunders, the affable, hard-working analyst who seemed to be Jackie King’s righthand man in her department, had gotten his cell phone hacked and Skywatch was using it as a listening device. Now, keep in mind that Mitch works in the realm of cybersecurity and infiltration. He knows what it takes to make sure you’re secure. More to the point, Jackie flat-out warned him about the rideshare and dating apps he was so fond of using, and they proved to be the very things that did him in. But can we really blame Mitch? We hear about the importance of cybersecurity and read about hacks and breeches, like last year’s massive Equifax hack. And yet, many—if not most—of us shrug them off, assuming they won’t happen to us. Or even if we do take steps to protect ourselves, everyday life happens and we get careless. We forget to turn off location tracking in our apps or make sure our firewall’s up-to-date on our computer. We rush through our actions and as a result, things get overlooked. Sometimes those things can get you killed. I was reminded of all of this when, ironically, I overlooked something significant to Ellis’s story. While reading issue #12, I was surprised when Lucy Blaze mentioned to Bendix that she had suborned a phone belonging to someone in IO’s Analysis division. I didn’t realize that she had done that and assumed this was the first time Ellis had made any mention of it. But then, as I was flipping through issue #11 a bit later, there the whole thing was, right on the third page. Granted, it’s a subtle four-panel sequence that’s sandwiched between two flashier scenes, but it’s there. I had just overlooked it, or perhaps seen it and disregarded it. Either way, I’d missed something important. Fortunately, it’s not a matter of life-or-death for me the same way it was for Mitch, but it goes to demonstrate how simple these oversights are to make. Thankfully, I don’t work in the world of high tech espionage. But those who do, both in real life and in the amped up fiction of The Wild Storm, need to sweat the details in everything they do. They live life in the crosshairs, constantly under covert attack by their adversaries. With organizations as large and complex as IO and Skywatch, those attacks can land just about anywhere. There’s quite a lot to lock down, stay on top of and defend, but your success depends on being able to do just that. Otherwise, your enemy can get the better of you, and the dirty little secret is that once you’re compromised, you’re pretty much disposable. If you’re lucky, that means you wind up getting unceremoniously let go. But if you’re unlucky, you just might end up the victim of the very first shot fired in a looming war. THE WILD STORM #12 by Warren Ellis, Jon Davis-Hunt and Steve Buccellato is now available in print and as a digital download.